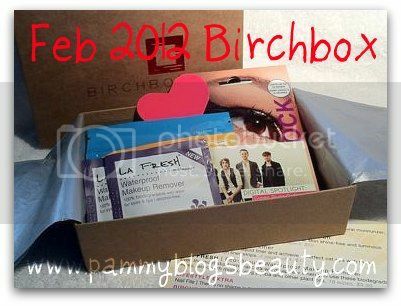 Pammy Blogs Beauty: February 2012 Birchbox: Spotlight Yourself! February 2012 Birchbox: Spotlight Yourself! Its that time again...time for my monthly Birchbox "box opening"! Before the box arrived this month, Birchbox gave me the opportunity to preview a couple of the month's box items: the Violent Lips Lip Tattoos and the Eye Rock Designer Liner Stickers. If you missed that review post, check it out here: Feb Birchbox Preview: Violent Lips and Eye Rock Designer Liners. So, this is the first month that I actually knew what I might be getting. But the rest of the box is a total surprise! What is Birchbox? It is a monthly beauty sample subscription ($10 monthly) for deluxe beauty samples delivered in a cute box right to your door! Rather than going through the full explanation again, I will direct you to some of my previous posts: Birchbox Introduction and Jan 2012 Birchbox "box opening". I have been a subscriber for over a year now and it is just so much fun! This month's theme is "Spotlight Yourself". Birchbox included items in the box to highlight your awesomeness and to attract a little attention. Benta Berry | G-1 Moisturizing Face Cream (.1 fl oz sample, full size is 110): I have never heard of this brand. So, I am curious about the product. The sample sure is small. But, I see that the full size is quite pricey. The cream feels nice and has a lovely "perfume" type scent. This French skincare line is brand-new to the U.S. Try their all-natural moisturizer, which regulates oil levels and keeps skin matte. Colorscience pro | glow and go Travel Puff: (.052 sample size, full sized compact $50): I am so excited that there is something from Colorscience in this box! Honestly, I have wanted to try this brand ever since I read somewhere that it is the brand of SPF that Cameron Diaz uses (lol, I know, I am so silly). But seriously, the idea of a high quality SPF in a powder form is quite appealing. I don't believe these puffs contain SPF, these are meant to be a touch up powder. Use these handy, powder-filled puffs to keep your skin shine-free and luminous while you are out on the town. Eye Rock | Designer Liner (full sized package! price 2 packs of 4 for $13.00): Gotta love it when Birchbox throws in a full sized product! If you missed my Birchbox Preview post, be sure to check it out as I reviewed these liner stickers. While these liner stickers aren't really my thing, it was fun to test them out and it's great that you, too, can try as a sample! For me the biggest thing was getting past the "sticker feel" of wearing them. But, if that doesn't bother you, you may like these. Certainly a unique product. Stop wrestling with the liquid liner and achieve a perfect cat eye with these single-use stick-on liner strips. LA Fresh | Eco-Beauty Waterproof Makeup Remover: (sample size: 2 wipes, full size 18 wipes for $9.99): I have not heard of this brand either. So, I can't wat to test these out. I really like the idea of makeup remover wipes for travel. This will eliminate one more mini bottle in my carry-on! I also like that these are eco-friendly and biodegradable. Even the most stubborn mascara will disappear when you use these biodegradable wipes, laced with moisturizing jojoba and other plant oils. Lifestyle Extra: Nail File | Ok, how funny is it that my fav thing in this box is this cute little heart shaped nail file! I am a sucker for cuteness and this little heart is just so-darn-sweet! This is going to go right in my purse. Birchbox, keep up with this type of freebie extra! I would love a theme shaped nail file each month!!! There is no shame in filing your nails in public with this heart-shaped neon looker. Birchbox Digital Download: This is a nice idea too...a link code for a free download. Six free tunes from Green River Ordinance, an indie rock band poised to hit the spotlight. All-in-all I am really pleased with this month's Birchbox! There is a lot of variety and the brands are pretty much new to me. I can't wait to try some of these things out! Also, be sure to check out this month's "February Issue" on the Birchbox website. They have fun articles on color trends, makeup tips, and even product use video tutorials. I see from browsing the Feb issue that there were some other great Birchbox samples this month like Beauty Blender Sponges (OMG, I would have loved to get this...maybe next month!) and a new product from Kiehl's (I swoon for Kiehl's). My fellow Birchboxers...what did you get in your box this month? Were you one of the lucky ones that got a Beauty Blender? If you did a blog post or video of your box opening...please link it in the comments below! @MLC-Awh man! That stinks!!! I would be dissapointed with small sample packets as well. Let me know if you find a great new sample service to subscribe to! I'm another that is very unhappy with this month's box, so much so that I wrote them. I think I'll change my profile and see what happens but there is nothing of value to me in this month's box. @MarciaF-I hope you get a good response back. Sorry you are unhappy too!